Alice in Wonderland 2010 Fan Site. News, Reviews, Products. Tim Burton's Alice * Video Games * Other Movies. We See Everything Through the Looking Glass! Today we have here a post on JuicyBomb advertising the sale of Alice in Wonderland themed clothes and lingerie FOR VIRTUAL PEOPLE by Katat0nik. Yes. You read that right. Those of you who play Second Life can dress up Alice style. Limited to August only. BUT! To visit the store you will need a Second Life. 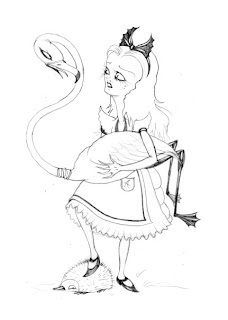 As if 2010 was already the Year of Alice, news arrives that publisher Harper/Collins will be publishing an edition of Alice in Wonderland with illustrations by Camille Rose Garcia. Via. These are really excellent. The artwork reminds me of Frank Pape. In Tim Burton news, please find here a thoughtful article with tons of screen grabs from Burton's Edward Scissorhands. And yet MORE Alice in Wonderland and fairy tale themed jewelry. This time from The Mymble's Daughter. In case you're wondering who the Mymble's Daughter is, see this Wikipedia entry. SyFy Alice Promo Tralier is Here!